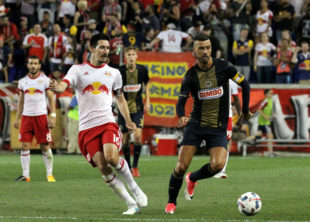 With New York seeming to accept it’s position outside of Supporters Shield contention, and the Union seemingly incapable of doing anything to change their position, this game felt subdued and insignificant right from the first kick. Granted taking a point home from Red Bull Arena is always a nice feeling, but for all 90 minutes it seemed neither team was particularly worried about the result that awaited them on the other end. There was a definite loser though, as ESPN cannot be too enthused about choosing this game to be their sole MLS broadcast of the weekend. As always, ratings start from a score of five, and points are added or subtracted from there. Easily the best player on the field for either team, a combination of acrobatics and quick reactions allowed the Jamaican international to keep a clean sheet despite the best efforts of the field players. The performance wasn’t flawless though, as twice he blocked a shot only to let the ball drop uncontrolled in front of an otherwise open goal. Red Bull failed to capitalize on this either time, but eventually mistakes like that will come back to haunt him. The negative side of Fabinho’s split personality was out in full force on Sunday. Sloppy passing, reckless challenges, and he shouldered Blake in the head causing the keeper to have to kick the ball out of bounds until he stopped seeing stars. The fact that a player with this level of talent managed to stay on the table until the 77th pick of the MLS SuperDraft says a lot of very bad things about the state of scouting for the Union, and in the US at large. Now we might understand a bit better why Marquez disappeared after his last start in April. It’s not that he did anything wrong, but he also failed to do anything to make himself stand out. It would be hard to replace the surprisingly effective Onyewu with what we saw on Sunday, but things become a bit less clear if the choice is between Yaro and Marquez. Good to see Keegan back at it, and doing well enough to quiet any questions about his role on this team going forward. On particular showcase this game was his offensive value, where he was a key contributor to the Union’s few serious threats on goal without sacrificing his defensive responsibilities. Worth specific mention was his read on the game in the 39th minute opening up a moment of surprisingly dynamic play, as well as his crucial block of Alex Muyl’s shot in the 67th. It was a quiet game from the captain, with a few moments of hustle counterbalanced by a few moments of sloppy play. With that said though, he is not the reason why the Union couldn’t get anything done on the offensive side of the ball. Unusually sloppy play from the Bosnian saw him failing to defend effectively, but more concerningly, his passes were often wayward and poorly weighted. That’s his main strength as a player, and a key part of any offensive hopes the Union have. This play from the 75th minute highlights everything that has been wrong with Pontius’ season this year. Had he chosen to shoot low at the far post, Robles probably would have stopped it as he is a very good keeper. But then there’s a chance Sapong cleans up the rebound and puts the Union ahead. It’s an outside chance, but it’s a far better one than the short-range chip that Pontius went with instead. Other than one notable error, Ilsinho’s only real mistake was failing to impact the game the way a central midfielder needs to. But it can’t be easy to be a professional soccer player and whiff a sitter like the Brazilian did in the 35th minute right at the top of the New York box. By no means is this the end of the road for Epps, but this was easily his most freshman performance so far this season. The rookie was easily dispossessed a few times, and failed to properly gauge the weight of a pass a few more times. He could still become a good enough player to be a regular MLS starter, but it appears he’s not quite there yet. As always, C.J. was out there trying to make something out of nothing, but unfortunately every attempt failed. He had more than a few shots that could have been game winners if he’d just been able to control the ball a little bit better, though it’s not easy to say whether blame lies with him or the man who passed the ball to him. No specific moment stood out for Creavalle, but his positioning right in front of the back four did allow Bedoya and Medunjanin to get further up field. Not only is this the first departure from a 4-2-3-1 formation in at least two seasons, but it was also a major contributor to the Union’s significantly improved control of the game at the beginning of the second half. This one doesn’t feel fair, considering Simpson isn’t the one who signed a very expensive player that doesn’t fit the team in any way. But at some point you do have to wonder why a professional isn’t willing or able to at least slightly adapt their game to try and make some sort of positive impact. Not much to say about Ray in such a short appearance. But it is curious that it took so long for him to see the field, considering Fabinho was already showing fatigue and narrowly avoided a second yellow card in the 76th minute. A few calls may have been questionable, but nothing that fundamentally changed the game. In MLS, that’s about as good as we can hope for. Is there a way to just give the point earned from a draw to him individually? It’s looking like the team won’t be needing it where they’re going, and it might be nice to give Blake something to remember us by once he’s on to bigger and better things. 2016 healthy Yaro might have a case, but as it stands right now it’s Marquez. 0-0 with nothing to really talk about but Blake – meh. Yup disinterested about sums it up. I have a question for those of you who know MLS’s convoluted rules. I think I understood that if we sold him we don’t get much becuase he is an MLS employee, not club employee, so the tranfer fee the U receives is capped. If the work permit thing can get worked out, can we trade him rather than sell him to get full value to the U, or does it have to be a sale? So I’ll take Fabinho any day over Winjaldum. Although Fab is far from perfect, Wijnaldum positioning on the field is horrible and he has no offensive impact. His decisions and taking on players 1 v1 has been poor as well. Fab. Still can get down the flank easily with dangerous balls in the box. As for Yaro, yes he has made two huge mistakes that have cost the union some games some would argue. But, you have to look at his overall game and he has been phenomenal I think. His passing is great , his calm and control under pressure is one of a kind. No other Defender on the team has this gift. He is also fantastic with breaking up plays and taking out opposing offensive players. His mistakes this year are easy to fix. Lastly , Creavalle should absolutely start on this team. It’s funny how one player can improve the offense and defense on a big way. His passing has been great and his defensive work as well. He has only shown that he is fit to play the Dmid role. Sadly, he has to beat out either Harris or Alej and in reality he has done that in my opinion. Derrick Jones needs to see the field as well. Both of these players need to be included in the line up somehow or at least paired up to be subs for each other. I want to see Jones over Creavalle. That being said, playing the 4-1-4-1 with Creavalle behind Harris & Bedoya is something we should have seen a few months ago, given our #10 situation this year. Yeah SilverRey, I’ve been an advocate for Derrick Jones the entire season. Stating from the beginning of the season, that he should start every game. He can become the best Dmid that’s ever played on this team. Can anyone explain that when Simpson comes on it isn’t a straight sub for an ineffective CJ? Moving Sapong to the wing is a pointless and to date, fruitless exercise. Neither are wingers and saying they once played there doesn’t a winger make. I once came on as a relief pitcher in a little league game and gave up the longest home run Shelby Co, Tennessee, had seen in an under 12 game. I don’t list “pitcher” on my resume. CJ’s touch has me sentimental for LeToux’s. He gets in the box and bangs in close-in sitters, that’s his game. On the wing he looks lost with the ball at his feet. The rating for Marquez is ridiculous, a 5? The review says it, ‘it’s not like he did anything wrong.’ Not sure what more you could ask of the defenders in a game like this than to do their job, which they did, they got a clean sheet. It is also kind of hard to do anything else when you’re consistently getting punched in the throat by the Red Bulls attack because the Union can’t score to alleviate pressure or keep possession of the ball for more than 4 passes. Elliot and Marquez are the pairing, as they compliment each other well. It’s the best combination of passing ability, athleticism (speed and strength), height, and tactical awareness. All telling, is that both Marquez and Elliot are good for only one foul a game, as opposed to Onyewu (43 fouls in 21 games) and Yaro (4 fouls in 8 games). Defenders who foul often are either out of position, inexperienced, careless, and slow. You can attribute those adjectives to Yaro and Onyewu in one way or another. Can’t say I agree. Elliot and Marquez both got beat all game. The reason for the clean sheet is simply Blake. Also, Marquez hasn’t had enough minutes this season to screw up. Give me Elliot and Yaro as the central Defenders and I’ll be content. If you rewatch the game, even just the highlights, Elliot gets beat bad at 26′ and 31′. Arguably, there are more errors from Elliot than Marquez that force saves from Blake. My point here is why does Elliot get a 7 and Marquez a 5? The review for Elliot has nothing to do with the game itself. Interesting that you feel Marquez hasn’t had enough minutes to screw up. What is your opinion on Yaro’s own-goal, conceding a 95th minute penalty, earning a 54th-minute red card, and fluffing a clearance that led to a game winning goal in the only 369 minutes he’s played? You can compare that to Marquez’s 852 minutes.